Chantilly is one of the most sumptuous châteaux in France. 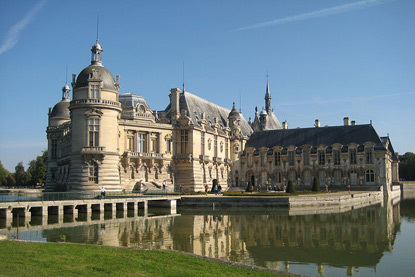 Home to many princely and ducal families, Chantilly is a set of several edifices of eclectic style. The gardens by Le Nôtre were the favourite of the celebrated landscape architect of Versailles and include an Anglo-Chinese section. Chantilly houses the Musée Condé, one of the finest art galleries in the country, featuring 20,000 exhibits, among which works by Botticelli, Raphael, Memling, Van Dyck, Poussin, Watteau and Ingres, as well as a historical library comprising 200 illuminated manuscripts. The castle, the Condé Museum and the Grand Stables are open every day except Tuesdays from 10:00 am to 6:00 pm (till 5:00 pm for the stables). The park closes at 8:00 pm. The library is open from Monday to Friday from 9:15 am to 5:00 pm. Admission to the castle, Condé Museum and park is 14 € for adults and 5.5 € for children from 4 to 17 years old. Admission to the Grand Stables, including the equestrian show "Chevaux en Fête", is 11 € for adults and 4.5 € for children. Combined tickets for everything cost respectively 18 € and 7.5 €. Special equestrian spectacles ("Ecuyères") are sometimes held and cost an extra 11 € for adults and 4.5 € for children. Audio guides are also available for 3 € per person (2 € for children). Guided tours will set you back 5 € (3 € for children).